What is a German Rottweiler Puppy? What is the difference between a German Rottweiler and an American Rottweiler? A German rottweiler is born in Germany, and an American rottweiler is born in the USA. All German rotweilers born after June 1998 (and some American rottweilers) have a tail, other than that, there really isn't much difference. Size, heads, bone and temperament is not indicative of a dog being of German or American lines, as some backyard breeders would lead you to believe. In fact, aside from the tail, the breed standards between the FCI and America are almost identical. Regardless of where a rottweiler is born, it is one breed, and all rottweilers belong to the same breed. Germany is where the rottweiler breed originated. It is an old breed, descended from the roman drover dogs. To this day, many great rottweilers are still bred in Germany, and in the US from select dogs imported from Germany. Both of our dogs are bred from pink/red papered German imports, but are American rottweilers since they were both born in the US. One big difference between Germany and the US is how dogs are registered, tracked and bred. In the US, anyone can breed a purebred dog to another purebred dog of the same breed and register the litter with the AKC. In Germany, breedings are approved by the breed warden - a representative appointed by the national rottweiler club (ADRK), that personally oversees and approves litters. Without the breed warden's approval of a litter, it cannot be registered. Every puppy is tattoed at eight weeks of age, and that number is used to track the dog throughout its life. 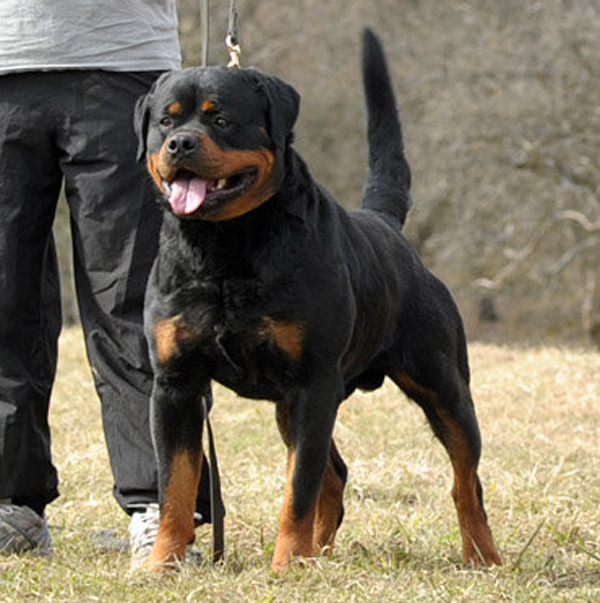 Before a rottweiler is bred in Germany, it must meet specific criteria, part of which includes passing a Ztp test. This breed suitability test requires an obedience title (BH), hip and elbow clearances, a conformation evaluation that includes weights, measurements and proportions, and includes a written evaluation of the dog by an ADRK judge (kormeister), and a temperament test. Further, one of the dogs must have earned a title in schutzhund. If the dog fails the Ztp and is ever bred, its offspring cannot be registered. This information is entered into the annual Kor book, and in the ADRK database (Dogbase), which encompasses all registered rottweilers and breedings in Germany, and keeps track of dogs from birth to death. Every breeding, every litter, every title, hip/elbow ratings, every ztp and korung evaluation is included in this database. It gives a breeder access to invaluable information about the dogs contained in a pedigree, written evaluations done during the dog's ztp, hip/elbow scores, and the ability to evaluate breedings by co-efficients and probabilities of certain traits on breedings. This is an extremely valuable tool that assists breeders in planning breedings and in making good breeding decisions. Some kennels here in the US follow breeding standards similar to the ADRK in Germany, however, breeding practices in Germany are really no better or worse than in the US. Each has advantages and disadvantages. Generally, in the US, reputable, code of ethics breeders tend to focus more on genetic health by clearing hearts, eyes, hips, elbows, and thyroid before breeding. Their dogs are typically titled in conformation, and some will also have working titles. In Germany, it is unlikely that any dog will have more than just hips and elbows cleared. Generally speaking, US breeders tend to breed more versatile dogs that can work in obedience, schutzhund, carting, agility, therapy, tracking and conformation. 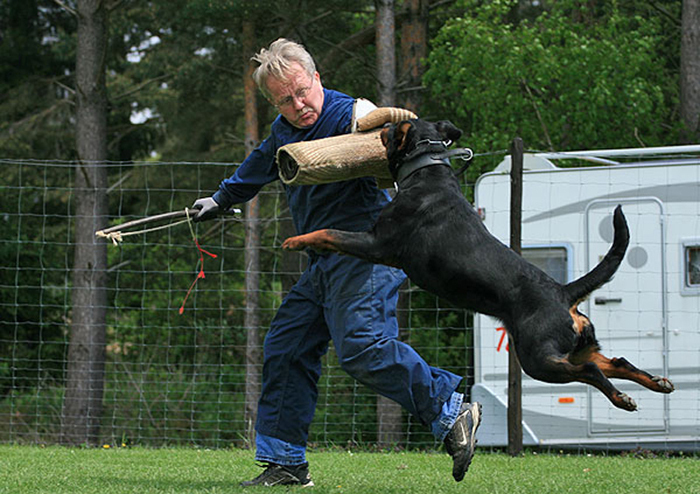 In Germany, most rottweilers are bred for and worked in schutzhund. In the US, most reputable breeders whelp and rear puppies in their homes, paying particular attention to early socialization and development, whereas in Germany, most dogs are kept and kenneled outside. If I have one complaint about many American breeders it is that there are not as many as should be putting working titles on their breed dogs. All too often I look in the catalogs at the shows I go to and not see a single dog in the breed ring with a title after it's name. For a working breed, I find this very sad. I also see very few rottweilers competing in obedience, rally or agility at the trials we go to. Generally speaking, I believe that the Germans have done a better job preserving the working ability of the breed than the Americans. However, no matter where a rottweiler is born, breeding top quality dogs is is an art of balancing genetics, pedigrees, knowledge, experience, and a little bit of luck, which is not exclusive to any particular part of the world, Germany or otherwise. The goals and ethics of an individual breeder's breeding program are what really makes the difference in what is being produced, not country of origin. Some breeders focus primarily on breeding for working ability, others for soundness & genetic health, others for temperament, and yet others for structure and type. The best breeders breed for ALL these qualities. 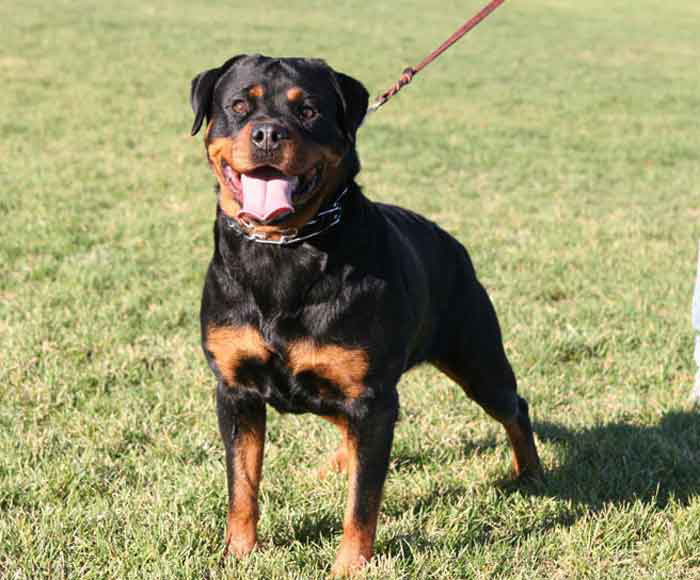 First and foremost, dogs used in any breeding program should be required to pass specific health certifications for diseases that most commonly occur in rottweilers. In the US, that means OFA certification of hips and elbows, CERF certification of eyes, and heart and thyroid clearances, with results submitted to and certified by the OFA. Dogs must also have correct breed type, structure, temperament, working ability, and versatility that makes this breed so unique. All are equally important in making the ideal, total rottweiler. If you are looking for a schutzhund prospect, keep in mind that a working dog must have correct structure, temperament, drive and health to effectively work and compete. The bloodlines on which the dog is bred must be proven capable of being highly trained, have strong nerve, and possess above average intelligence. Above all, they must be able to work with their handlers in a partnership, be biddable and highly obedient. Top performance dogs don't happen by accident, but as a result of generations of selective and careful breeding designed to set specific desirable traits. Only rottweilers that have been bred specifically for this purpose on proven working lines can truly excel as working dogs. Also keep in mind that if you are looking for a family pet, a dog from working lines may not be the best choice for you. The traits that make a good working dog are also the same traits that make a dog extremely hard to live with for the average dog owner. It is important to do plenty of research on breed characteristics to ensure a good match between you and your breed of choice. There are a lot of breeders out there that like to say they are breeding German rottweilers, when in fact they are backyard breeders, breeding from unproven dogs that may have some German imports in the pedigree, and try to pass their puppies off to unsuspecting buyers as "German rottweilers". If a dog is born in the US, it is not a German rottweiler, period. German rottweilers are those dogs that are imported directly from Germany, but just because a dog is imported from Germany does not mean it is a quality dog. Some of these German dogs are sold to people in the US because the dog isn't good enough to be used in a German breeding program. Germany's rejects are often what gets dumped over here in the US with breeders that are inexperienced and new to breeding. Be cautious, don't buy into the hype, and do your research on a potential breeder very carefully. Owning a German Rottweiler means absolutely nothing if your dog is unhealthy or has a poor temperament. A breeder that is breeding and importing German dogs, but indiscriminantly selling puppies to anyone that will pay their price is not a breeder, but a puppy mill. Good breeders are no different whether they are breeding on German or American lines - they carefully breed their dogs and want them to only go to the very best of homes. If you are not able to obtain a puppy from a code of ethics breeder or are unwilling to wait for the right breeder or litter, I highly recommend that you look at rottweiler rescue rather than dealing with a backyard breeder, puppy miller, or unethical breeder that is only interested in getting your money. If this is the kind of breeder that you are willing to settle for, then you will find that rottweiler rescues are overflowing with dogs from these kinds of breeders. In most cases, they are not in rescue because they are bad dogs, but because they had bad owners, and rescue dogs make WONDERFUL pets. vom Aztlan Rottweilers is committed to the complete show and working Rottweiler that shines in the puppies we produce, our on-going involvement in dog sports, and the unique relationships we build with our Rottweiler Puppy buyers.